Are you searching for a really comfortable nursing bra that might also support your active lifestyle? 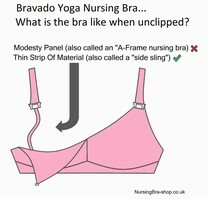 The Bravado Body Silk Seamless Yoga nursing bra is a great choice for low impact activity such as yoga, pilates, walking.....its also really nice as an everyday nursing bra. So what makes this nursing bra a great choice? Well, this bra has offers amazing comfort thanks to the fact that it is luxuriously soft. We think you will also find it even more comfortable thanks to the fact that it is seamless. You will also find that your size changes during your nursing months so you will be pleased to know what this nursing bra has a 4-way stretch that will allow the bra to mould to your changing shape. How about the sizing? This nursing bra comes in just four sizes – Small, Medium, Large, Extra-Large. Each size covers several different sizes. This means it is easy to pick the correct size and also means that as your size changes the bra should remain really comfortable. Which size should you pick? Please see the size chart below. So why do we think this bra will be great for low-impact activity such as yoga, pilates and walking? Well, it features Anti-Microbial Silverbreeze technology which will help to prevent the growth of odour-causing bacteria. This will help to keep your bra fresh. It also has criss-cross straps. How about the cups? Well, the cups have removable foam inserts for shape and discretion. You should also find it easy to open and close the cups....we think you will find this really useful when you maybe holding your baby in one arm. Breastfeeding consultants tend to suggest that you choose, if possible a wirefree bra so you may be pleased to know that this bra is wirefree. This nursing bra will also give you skin-to-skin contact with your baby thanks to the cups that drop away fully. So why do we think you should choose the Bravado Seamless Yoga Nursing Bra? We think it is perfect if you want to continue with low-impact activity and if you are also looking for a really comfortable nursing bra.